Another early review for The Herald assigned by the great Margaria Fitchner. This one, an authorized, then unauthorized biography of David Geffen, was embargoed by the publisher and I had to sign a nondisclosure form. Much ado about nothing, as the book caused a mild stir, then disappeared from sight. Sadly, author Tom King, a reporter for the Wall Street Journal, died shortly after the book came out. 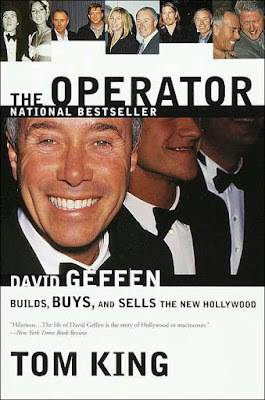 The Operator: David Geffen Builds, Buys, and Sells the New Hollywood. Tom King. Random. 688 pages. David Geffen's is a typically American rags-to-riches story. But what rags! What riches! Wall Street Journal writer Tom King's biography of the agent and entrepreneur — whose client list included Tom Cruise, Cher, Nirvana, John Lennon and Yoko Ono, Bob Dylan, Elton John and the Clintons — is a sharply written letdown. Despite exhaustive research, including hundreds of interviews with Geffen's friends, enemies, victims, benefactors and kin, The Operator fails to live up to its advance hype. There are no startling revelations, other than a smattering of specifics about the man's sexual profligacy, which is hardly headline news. Like Sammy Glick in Budd Schulberg's 1941 novel, What Makes Sammy Run?, Geffen is portrayed as a lying, venal careerist whose scorched-earth ambitions leave a trail of broken friendships and bitter enemies. But unlike Glick, Geffen is far more complex and conflicted; a philanthropist, patron of the arts, humanitarian, fiercely loyal friend and political insider and activist. Born in Brooklyn in 1943 to war refugees, young David exhibited behavior that would now be labeled as attention deficit disorder. Restless in school, dishonest, manipulative and argumentative with family and teachers, the street-smart Geffen gradually learned how to use those qualities to get ahead. Moving to Los Angeles in an abortive attempt at higher education, Geffen dropped out and returned to New York, lying his way into the leading talent management company of his day, the William Morris Agency. Assuming no one would bother to check his resume, he claimed to have graduated from UCLA.When someone did investigate, Geffen intercepted the school's letter, and begged his brother, a Los Angeles lawyer, to concoct a placating substitute. But Geffen's academic record proved irrelevant; sheer ambition vaulted him from the mailroom to the executive suite in record time. "Geffen simply worked harder than anyone else, " King writes. "He came in early and stayed late. The Morris office was his classroom." At the agency, Geffen purposefully cultivated and flattered senior agents and executives and forged alliances with junior employees that would prove valuable as their careers developed. He parlayed a management stint with troubled-but-brilliant songwriter Laura Nyro into co-ownership of her songs, and their subsequent sale to CBS made him a millionaire at 27. The west coast's burgeoning post-hippie music scene beckoned, and Geffen helped germinate the seed of the Crosby, Stills, Nash and Young–Joni Mitchell–Jackson Brown–Linda Ronstadt–Eagles axis. Establishing strong working relationships with these artists, along with executive mentors and father-substitutes like Columbia Records' Clive Davis, Atlantic Records' Ahmet Ertegun and empire-builder Steve Ross of Warner Communications, Geffen was well on his way. Personal management grew tedious, so with the help of Ertegun and Ross, Geffen founded, then sold two successful record companies, turning his profits into a fortune through shrewd timing, luck and chutzpah. Geffen's most recent venture is the entertainment conglomerate, Deamworks SKG (he's the "G"), in partnership with Steven Spielberg and former Disney executive Jeffrey Katzenberg. Unlike earlier moguls, Geffen isn't a manufacturer, innovator or artist. He preceded the Internet millionaires whose fortunes rose in anticipation of future profits. Instead, Geffen's sheer force of personality and willingness to abandon mentors, sell out relationships and lie — as well as his knack for being in the right place at the right time — molds his success. But at the same time, Geffen also demonstrates fierce, if sometimes inconsistent, personal loyalties toward ailing friends and seemingly ungrateful relatives. Though publicly closeted for most of his life (and vilified for it by the gay press), he became a leading supporter and fund-raiser of anti-AIDS projects and political action groups and a confidante and supporter of the Clintons. King began The Operator with its subject's support and participation. Geffen not only sat for seven interviews but also urged friends, family and business associates to cooperate. Although he suddenly changed his mind, he apparently didn't try to kill the book entirely. One wonders if the canny Geffen's move was a strategy to allow him "cover" if the book became controversial or bad for business. In fact, The Operator offers an entertaining portrait of a complex and conflicted man, but it is unlikely to stir much interest outside the entertainment industry and its knotted circle of Geffen's friends, ex-friends and enemies.